Minutes earlier, I sat on a couch in Hygge and mentioned the words “nudist colony” to Scott Galloway, director at Susie Films, at the request of his business partner, Eric Davis. “I told her the PG version,” Scott says as he stares down Eric. Eric grins back like a 13-year-old boy who pulled off a prank. They continue to joke with each other, dancing around the subject. You can tell these guys work together a lot by the way they interact. 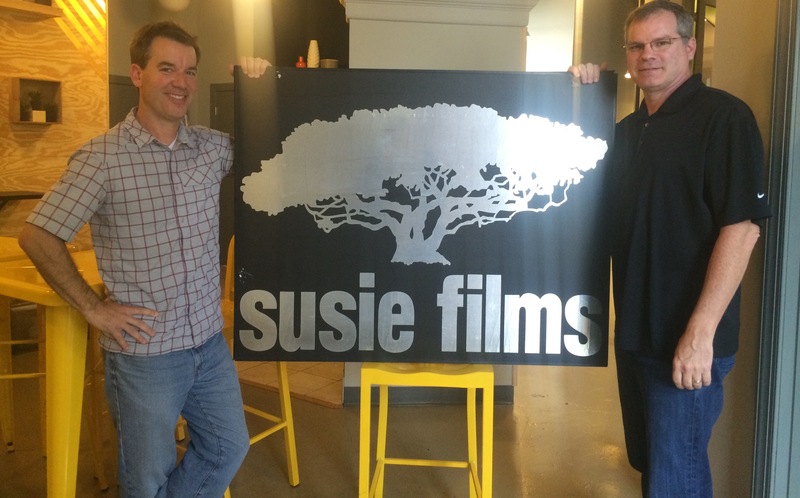 Scott and Eric modeling the Susie Films sign. “No matter how hard you try to prepare to see a lot of naked people, it’s like seeing a jackalope on Tryon,” Scott says. Storytelling is an art and Eric and Scott know how to do it well, even when it involves nudist colonies. Scott always observes the way people watch film. A few years ago he noticed his three children watching videos on his wife’s laptop, but they kept scrolling to the bottom to see how much time was left. That interaction birthed what is now the 100 Words Film Festival. A compelling story doesn’t have to have a long script, it can be 100 words. This year, around 100 entrants created films with only 100 words for the festival — 36 of those will be shown over two nights. Entrants range from professional filmmakers to student filmmakers. There are also six films made by students who were chosen to be a part of the student/charity mentoring program. It’s a mutually beneficial experience because students are mentored by Susie Films and in turn, nonprofits get a compelling film. Three of the six films are made by Charlotte-area university students (Johnson C. Smith University, Davidson College and Queen’s University). Nine film industry speakers will talk on Saturday (Nov. 5) in Spirit Square. It’s free and open to the public. When Scott talks, you can tell wheels are turning in his head. He’s a visual artist, but his enthusiasm translates into his words. Susie Films has extended crew members across the country, but the core team is based out of the Charlotte office. And while film incentives have turned many off of the idea of producing film in North Carolina, Scott says many are still interested. Susie Films did a shoot in Los Angeles with Giada De Laurentiis when the California-based crew saw they were from Charlotte. A cameraman quickly said he would love to move to Charlotte because it’s growing, the cost of living is lower, it’s three hours from the beach, etc. “He was reading off the Chamber of Commerce spiel,” Scott laughs. But the film industry is huge in Los Angeles and he was afraid to leave the constant stream of work. While Charlotte is no L.A., Scott says there are amazing advertising agencies, television networks and production companies in the city. “A Man Named Pearl” (Netflix) — You finished watching “Stranger Things,” Season 2 of “Narcos” and the Amanda Knox documentary. Now, you should watch “A Man Named Pearl.” It’s a documentary about a South Carolina man who is a self-taught topiary artist. “Overdraft” (YouTube) — The federal debt is no joke. This intriguing documentary was made when the debt totaled $14 trillion. It is now around $20 trillion. “Handcrafted America” (INSP) — Host Jill Wagner travels around the country talking to artisans who make things the traditional way. Also, Scott is one of this year’s TedxCharlotte speakers. RSVP to the Hygge viewing party in the OrthoCarolina Living Room to hear him talk!